I found an old clipboard and decided to pretty it up. I used some wrapping paper that was created and gifted to me by my talented friend and coworker, Suzanne. Unfortunately the paper was a little thin for the task, and tore a little in one spot along the edge, so I recommend using a heavy wrapping paper or even wallpaper. Scrapbook paper was a little to short to fit. I used mod podge to glue it all on. 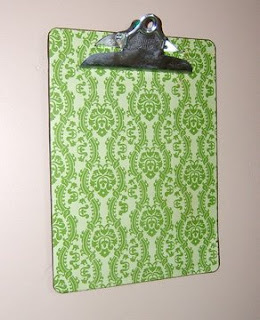 I intend to used it to hang my lists of projects I want to complete, and sketches of projects and other such things. You should try it. Easy, fun, cheap, and cute.